1 You may have heard that polar bears are endangered. What does that mean exactly? Endangered means there are very few of that kind still alive. Someday they might become extinct. You may wonder what people can do to help endangered animals. 2 People can protect plants and animals from becoming endangered or extinct. One way is to protect the animals' or plants' habitats. Governments can set aside land for parks. No one is allowed to disturb the habitat inside park lands. People cannot build houses there. They cannot hunt animals. 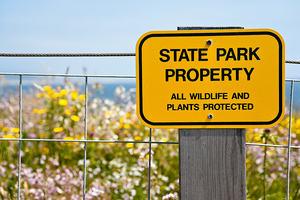 No one can collect plants or animals from inside the park. Mining and drilling for oil is not allowed in parks. 3 People can make laws that protect plants and animals. Laws can be made to protect habitats. Hunting laws do not allow people to hunt certain animals. Some laws limit the number of trees that can be cut down in forests. Other laws say that people cannot build homes, factories, or stores in certain places. Laws can protect the air and water from pollution. Feedback on How Do People Protect Plants and Animals?